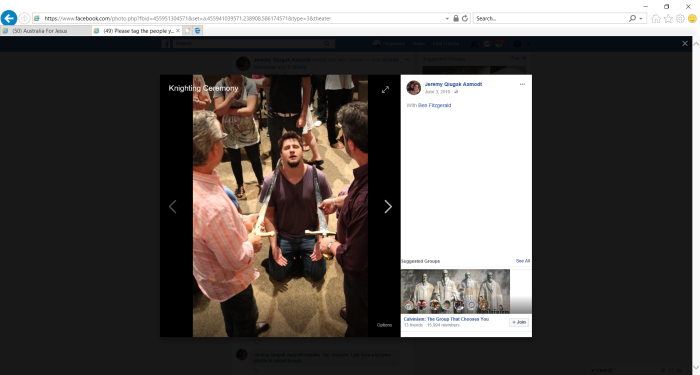 We recently posted an article from Church Watch Central about the Bethel Church “knighting ceremony” for Ben Fitzgerald, who is a missionary for Bethel and whose parents run the Christian ‘Tarot’ card New Age ministry, Christalignment, which Bethel first repudiated but then – when finding out it was their associates doing it – deleted their rebuke and affirmed them. In that post, we provided photographic evidence of Ben Fitzgerald being knighted with what appeared to be an actual sword. You can find that post here. We promised Part 2, which would explain the possible origins of this bizarre rite in the New Apostolic Reformation. Here’s the explanation. It seems affirmed by Ben Fitzgerald himself on the Pulpit & Pen Facebook thread. While we plan on exposing the NAR connections to the Roman Catholic Knights of Malta (the commenter, Fizell, is correct by the way), but what was telling, was Ben Fitzgerald’s seemingly affirming comment. He responded, “Wow wonderful picture, thanks for the reminder. What an amazing day that was”. What is Joel’s Army? Joel’s Army – named after Joel 2:1-2, with extensive modern historical roots the details of which are beyond the scope of this series, is in its current iteration a movement that combines the Latter Rain Movement and charismatic Dominionism. This chapter is the brainchild of Todd Bentley, but has been continued by New Apostolic Reformation “apostles” since his fall into the disgrace of adultery and alcoholism. The Latter Rain Movement was the Second (and most dangerous) Wave of the Charismatic Movement, which believed that the faux-signs and wonders claimed by charismatic prophets were the “latter rain” as spoken of in the Messianic prophecy of Joel 2 (which is cited in Acts 2 by Peter, as fulfilled at Pentecost). Peter says that the pouring out of the Holy Spirit at Pentecost is the fulfillment of Joel 2, which includes the “latter rain” metaphor in verse 23 and 24. Israel had two rainy seasons, the early and latter rains. In the Holy Spirit’s metaphor through Joel, the earlier rain was the prophecy given by the prophets of the Old Testament, and the latter rain was the prophecy poured out upon the New Testament apostles and prophets. In the charismatic “Latter Rain” view, however, the earlier rain is that which was poured out upon the New Testament Apostles and prophets, and the latter rain is that which is being poured out now. From this idea has come the New Apostolic Reformation (NAR), which is a movement that purports to be a return of the Apostles and with it, Apostolic Authority. Combined in the milieu of the New Apostolic Reformation and the Latter Rain Movement is charismatic Dominionism. A theology that is functionally post-millennial and was created by a 1987 meeting that sought a bridge between Calvinist Reconstructionism with Charismaticism, and involved Joseph Morecraft and Gary North (source link). Adding a functional post-millennialism to the fires of charismaticism gave them the Seven Mountain Mandate, which claims that God desires that Christians “redeem” the seven aspects of culture including education, religion, family, business, government, arts, and media. The spearhead for this dominionist takeover was the idea of Todd Bentley, set forth during the heyday of the Lakeland Revival. Bentley taught that the locusts of the Book of Joel represent charismatic prophets leaving mainstream Pentecostal denominations and following after the radicalized leaders of what would become the NAR (in Joel, the locusts actually represent God’s judgment and are a bad thing). So then, Joel’s Army was born at the doomed and debauched Lakeland Revival. We affirm that the army in Joel 2:1–11 was an ungodly Babylonian army that destroyed Jerusalem in 586 BC. We believe that this passage has a double fulfillment in that it also points to the Antichrist’s army that will attack Israel at the end of the age. We affirm that Joel was prophesying about the lifestyle of godly believers in Joel 2:12–17. We deny that Joel 2:1–11 describes the end-time Church. This rejection from IHOP comes after the destruction of the Lakeland Revival and not before, and is probably a reaction to Bentley’s dramatic implosion. Other NAR Apostles who laid hands on Bentley and have since restored him – like Rick Joyner – are still operating according to this disastrous Joel’s Army theology. Bentley began the effort with Fresh Fire Ministries of Canada and even handed out dog tags to express the movement’s militancy. Today, this movement is continued among the group known as the New Apostolic Reformation. Those figures include Ken and Gloria Copeland, Todd Bentley (he’s still preaching), Patricia King, Jennifer LeClaire (formerly Charisma Magazine), Beni Johnson, Cindy Jacobs, Rick Joyner, Amanda Wells, Rod Parsley, Bill and Jen Johnson, Kris Valloton, and Heidi Baker. 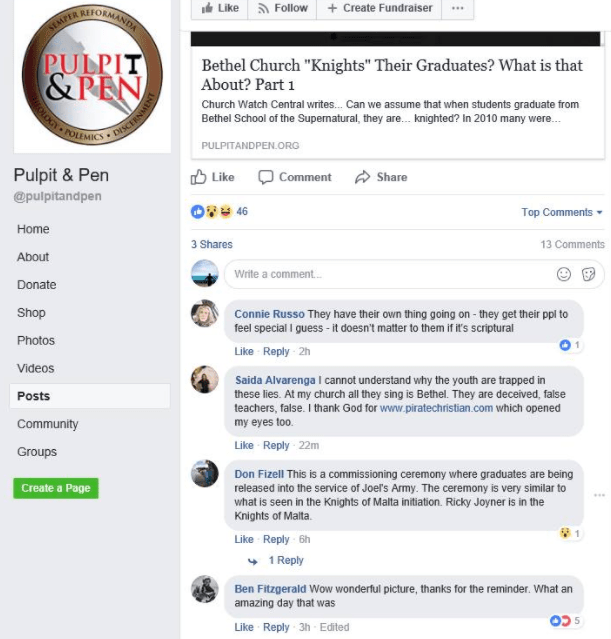 Sadly, Bethel and NAR are very secretive, and they won’t come out and explicitly say what the weird knighting ceremony is about or how it’s remotely scriptural. So, this leaves us to speculation. In Part III, we’ll discuss an equally as likely reason for the knighting (but perhaps even more concerning), the Knights of Malta.